On Wednesday, students at Stanford University showed off their vision for the home of the future. 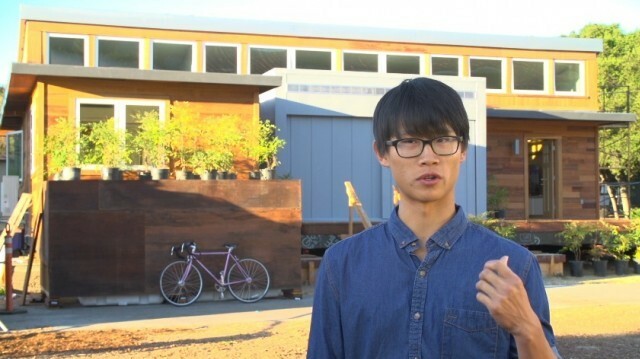 The one-bedroom, one-bath cottage is their entry in the Department of Energy’s biennial Solar Decathlon, in which students from around the world compete to design the most affordable green dwelling. "Part of why we love doing this is it’s not just a homework assignment or a grade at the end," said Stanford student Derek Ouyang, team leader for the project. "It’s a real project with real problems and a real end result." The so-called “net-zero” home supplies all its own energy from rooftop solar, recycles water from sinks and showers and helps reduce smog with a paint that breaks down nitrous oxide in the air. The Stanford team's main innovation is what they call the "core." It contains all the utilities and plumbing for the house in a large central box. The house can be built around it. Ouyang said it allows a house to grow with its residents. "A home is something that is important to anybody, and most people want to be energy efficient but they don’t really know how to," said Ouyang. "So that’s a big part of why the core really enters that market. Because it gives people an easy way to design and build an energy efficient home." Later this month, the house will be dismantled and shipped to Southern California for the week-long competition. Santa Clara University is also fielding an entry.